It’s time to book your holiday to Ibiza and get ready to fly to the world’s number one party island. This Balearic island is famous the world-over, with tourists jetting in from all corners of the globe to enjoy cheap holidays, sunshine and a non-stop party atmosphere. You can easily find the best possible deal for a holiday to Ibiza by using our handy search tool, which is located at the top of the page. This will be your first stop on the road to finding your ideal cheap holiday to the Spanish party island. even stay in an upmarket villa with your family, we will be able to help you find the ideal hotel or resort in Ibiza to work within your budget. The nightlife and club scene is undoubtedly the biggest attraction for those looking to book a holiday to Ibiza, with some of the most famous DJs in the world taking up residency in the many clubs on the island. The bars really come to life in the evening, with the party then continuing long into the early hours of the morning. Some parties even spill out onto the beach, with delighted holidaymakers reveling in the sandy surroundings of the Mediterranean Sea. Midnight music in the Mediterranean makes it extremely easy to see why so many holidaymakers are lured to Ibiza. local cuisine and tapas. Of course, the extremely large amount of English holidaymakers means that those who would rather have a typical English breakfast, or even fish and chips, can find the ideal restaurant (or Irish pub!) for their tastes. Once you have had your fill of the finest food Ibiza has to offer, it is time to brush up on your Catalan and hit the beach. The time will fly as you relax and soak up the rays on one of the many Balearic beaches the island has to offer. So, what are you waiting for? 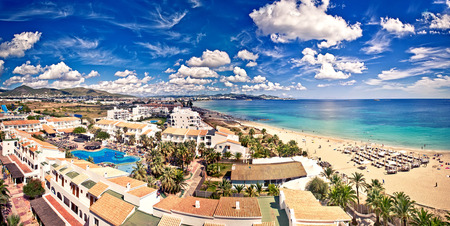 Book your cheap holiday to Ibiza today! You might just find that last-minute bargain flight you have been dreaming of. Seven Places to Watch the Sunset Around the World - We've picked out some of the world's best places to watch the sun go down. Take a look!. Europe’s Cheapest Beach Breaks for Party Animals - Ready to hit the beaches and bars of Europe? Read on. Five Brilliant Destinations for a Romantic Break - Finding the right destination for a romantic break is a bit like looking for the perfect romantic partner.